This is such a comforting image of God and puts us in mind of Jesus teaching about the Shepherd who leaves the 99 to go after the 1. God is anything but an absentee father. He devises ways to bring us to bring us back. He loves us so much that He plots and plans and fixes fixes to fix us. He didn’t say anything more and he left the store. At first I did not understand but as I thought about it I realized he was saying to me that he used to believe it was up to him to hold on to Jesus but now he believes that it is about Jesus holding on to him. That was an epiphany for me. I received that man as a messenger from God. It began a life long pursuit in understanding God’s grace as opposed to trying to work my way into being the perfect Christian, because the latter will never happen. Even before I go astray, God is devising a way to bring me back. The great hymn puts it so well. I have a question for you and am having a discussion with a friend about communion wine. He believes in no alcohol intake and feels like grape juice is appropriate for communion. I explained to him that the wine is blessed and used as part of the holy sacrament of communion. He feels that wine during Christ’s time was not fermented and contained no alcohol. I looked up a website about communion wine and it stated that during Christ’s time that there was no refrigeration, therefore grape juice would naturally ferment into wine. He feels that he has been mislead over the years and would like clarification as to rather or not it is a sin to take in any alcohol according to the bible, even during communion. He does not drink at all and I occasionally have a glass of wine or a beer. He believes that is a sin. Could you clarify our friendly argument about the differences between moderation and abuse, as well as, rather or not blessed wine is appropriate for communion according to Christ’s teachings. I, of course believe it is, but I am asking this for my friend to help him understand. God Bless and thank you! Great question. From a historical perspective those who oppose alcohol offer a relatively new argument and it is very American, unknown in many parts of the world. It is a non issue for many Christians in other parts of the world which should at least make us wonder. Jesus’ first miracle was to turn water into wine, not grape juice. Wine is wine. Thus the people remarked that you usually serve the best wine first then bring out the cheap stuff later. Why? Because after a few glasses they are intoxicated enough to not tell the difference. If alcohol was sinful, this would not have been our Lord’s first miracle. The biblical admonition is not to avoid drinking but to avoid drunkenness. So St Paul says “Do not be drunk with wine but be filled with the Holy Spirit.” When the Apostles were accused on Pentecost of being drunk for speaking in tongues St Peter said ” We are not drunk as you suppose, it is only 9 o’clock in the morning.” Neither the detractors nor St. Peter were not talking about grape juice. Jesus instituted the Eucharist at the Passover Meal which included wine. Ask a Rabbi if they drank grape juice at the Passover and he will laugh at you. Look at it logically. Grapes are harvested in the fall. The Passover is in the Spring. Without refrigeration the grapes get happy. In terms of the sacrament, we are required to offer the same species that Jesus instituted. We have no right to change what our Master ordained. If your friend does not want to take the wine that is okay. We are required to offer it but you are not required to take it. Since flesh and blood cannot be separated, to receive one is to receive both. We have a number of folks who only take the bread. That is appropriate and we honor individual conscience. Lastly, St. Paul told Timothy to take a little wine for his oft infirmities. Again he was not prescribing grape juice. Come to think of it I’m not feeling so great myself. Cheers! I stand before you as a man who clearly is a poor planner. I asked Fr. Palmer to preach last week on Pentecost, forgetting that the week after Pentecost is always Trinity Sunday. Now it is left up to me to try to explain the unexplainable and I have no one else to blame but myself. Actually it is a privilege to address this sacred topic and I use the word “address” intentionally because it is not my goal to explain it. I am not smart enough to explain the Trinity and I am not convinced that we should even try. The Trinity is a truth that we accept by faith, not a riddle to be solved. What makes the Trinity a mystery for us is that it defies logical explanation. We could understand it if the Father was 1/3rd God and the Son was 1/3rd God and the Spirit was 1/3rd God and together they make One God. But as you know, that is not what the Church teaches. Here is how the ancients put it. Whosoever will be saved, before all things it is necessary that he hold the catholic faith. Which faith except every one do keep whole and undefiled; without doubt he shall perish everlastingly. And the catholic faith is this: That we worship one God in Trinity, and Trinity in Unity; Neither confounding the Persons; nor dividing the Essence. For there is one Person of the Father; another of the Son; and another of the Holy Ghost. But the Godhead of the Father, of the Son, and of the Holy Ghost, is all one; the Glory equal, the Majesty coeternal. Such as the Father is; such is the Son; and such is the Holy Ghost. The Father uncreated; the Son uncreated; and the Holy Ghost uncreated. 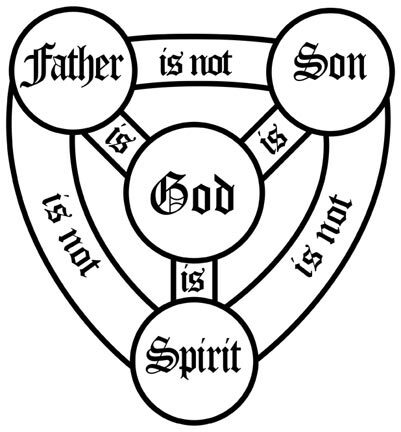 The Father unlimited; the Son unlimited; and the Holy Ghost unlimited. The Father eternal; the Son eternal; and the Holy Ghost eternal. And yet they are not three eternals; but one eternal. As also there are not three uncreated; nor three infinites, but one uncreated; and one infinite. So likewise the Father is Almighty; the Son Almighty; and the Holy Ghost Almighty. And yet they are not three Almighties; but one Almighty. So the Father is God; the Son is God; and the Holy Ghost is God. And yet they are not three Gods; but one God. So likewise the Father is Lord; the Son Lord; and the Holy Ghost Lord. And yet not three Lords; but one Lord. For like as we are compelled by the Christian verity; to acknowledge every Person by himself to be God and Lord; So are we forbidden by the catholic religion; to say, There are three Gods, or three Lords. The Father is made of none; neither created, nor begotten. The Son is of the Father alone; not made, nor created; but begotten. The Holy Ghost is of the Father and of the Son; neither made, nor created, nor begotten; but proceeding…. So the Father is fully and completely God and the Son is fully and completely God and the Spirit is fully and completely God but there is only One God. It is not One Person playing three roles but Three Persons as One God. Someone might object that it makes no sense to believe in something that sounds so contradictory, but I would argue that just because something sounds contradictory does not mean it is not true. Let me give you this example. If I was to get a radar gun (like the ones the police use regularly to detect how fast my wife is driving) and I pointed at the congregation right now, how fast would it say that you are going. It would record a zero and that would be the truth. You are sitting relatively still. But if I were on another planet and was able to clock you with my radar gun it would say that you are going about 30,000 miles an hour because that is roughly how fast our planet orbits the sun. And that would be the truth also. It seems contradictory but both are true. You are at the same time sitting still and traveling about 30,000 miles per hour. Try explaining that one to someone from the Middle Ages (or Arkansas). What we must not do is allow the fact that the Trinity is a mystery to have us categorize it as irrelevant, like how many angels can dance on the head of a pin. As Christians our entire spiritual journey is from beginning to end a Trinitarian experience. We are baptized in the Name of the Father, Son and Holy Spirit. We pray to the Father in Jesus’ Name through the power of the Holy Spirit. Our marriages, our homes and all that is sanctified and set apart for God are done so in the Name of the Blessed Trinity. Each week we invoke the Father to send the Spirit to make the bread and wine to be for us the Body and Blood of the Son. And on our dying bed a priest will pray over us, “Depart, O Christian soul, out of this world; In the Name of God the Father who created you; In the Name of Jesus Christ who redeemed you; In the Name of the Holy Spirit who sanctifies you…” We are cradle to grave a Trinitarian people but it is only when we stand before God that we will know, even as we are known. And while we can never in this life fully wrap our minds around the mystery of the Trinity, it does not mean there is nothing to learn from this truth. God who has always been in Trinity of Persons and Unity of Being said, “Let us make man in our image.” (In case you missed it, that was a pretty good hint right there about the Trinity in Genesis 1). And God made male and female in His image. Therefore to better understand the nature of God helps us understand what we have been created to be. First, God exists in communion or intimate fellowship. The Father and the Son and the Holy Spirit have always been. God did not have to make man so that He had a way to express love, or because He was in need of fellowship. The Trinity has been in perfect love and unity since before time. This Trinitarian echo in us of living in communion is why the Church will always be. Over the centuries various voices of philosophers and atheists and despots have prophesied the end of the Church but they underestimate the Bride of Christ. We are in the Son as the Son is in the Father. The unity of the Spirit fulfills this God implanted longing to belong and it is stronger than our political differences and even many of our doctrinal differences. We are even one with parts of the Body of Christ that have their doubts about us. Because God exists in communion we experience the communion of the saints. Second, observing the Trinity is a lesson in love. Love has given them an inseparable unity. When Philip asked to see the Father, Jesus said that if you have seen Him then you have seen the Father. They are one. Jesus said that as the Father has loved Him, so He has loved us. Now just let that sink in for a moment. Jesus loves you in the same way that the Father loves Him? How much does the Father love the Son? Does the Father pity Him and barely tolerate Him; or does the Father delight in the Son? Does the Father give and withdraw His love from the Son so that the Son can never be certain of His love; or does He love the Son with an everlasting love? 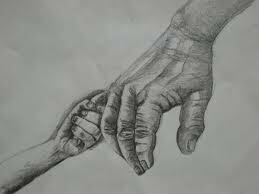 Is the Father an absentee Father or is He one with the Son, intimately involved in His life? As the Father loves the Son, so the Son loves us. Jesus delights in us, He loves us with an everlasting love and He seeks to be intimately involved in our lives. After Jesus says that He loves us as the Father has loved Him, He tells us to love one another and then goes on to say that there is no greater love than this, than to lay down one’s life for one’s friends. He of course did not just say this, He did it and His example of love has inspired millions. Tomorrow is Memorial Day when we remember those who have laid down their lives for their friends and we worship in freedom today because of their sacrifice. We must never forget them. And we must not let their sacrifice be wasted by being cavalier about the freedoms they died to defend. Third, and this is amazing to me, the Trinity models for us how to be subject to one another. You have to piece the story together but the Bible describes how Satan was once an angel, but because he who wanted to be God, he and his legion were ejected from heaven. By contrast we see the Son of God, who is God, but rather than demanding His rights of power and privilege, He humbles Himself and takes on flesh and is obedient to the Father, even to the point of death on the cross. Jesus said that He had come to do the Father’s will; that He only says what the Father says and does what the Father does. Out of love Jesus did not put His own need before that of the will of the Father or even His own needs before ours. And how does the Father respond? At Jesus’ baptism the Father announces to the world that this is my beloved Son in whom I am well pleased. Because the Son has glorified the Father, the Father glorifies the Son and gives Him a Name that is above every name. We see more lessons in humility when we consider the Holy Spirit. He is God and yet He did not come on His own. He waited until the Son ascended to heaven and sent Him to the Church. And when He came to the Church He did not come drawing attention to Himself. He came to convict men of sin and inspire faith in the Son. The Spirit inspired men to write the Holy Scriptures and Jesus Himself tells us that the book is about Him. When the Spirit indwells us, He does not make us Spiritans, He makes us Christians, one with Christ. The reason I said earlier that this quality of the Trinity amazes me is because left to our own imagination, man does not look for this kind of humility in a God. We do not expect a God to say “I have not come to be served but to serve and give my life as a ransom for many.” We don’t expect a God to wash the feet of His disciples. We don’t expect a God to say, “Nevertheless, not my will but thine be done.” And yet these are the examples that the Trinity has set for us. Knowing this is how our God is, it makes human pride even more ridiculous and despicable. There is a reason that we feel so fulfilled when we serve others, when we put the needs of others before our own, when we share with others the love of God. It is what we, as image bearers of God, were created to do. It feels right because it is right. I remind you of the famous quote by Augustine about the Trinity. If you try to understand it, you will lose your mind but if you don’t believe it you will lose your soul. We do not come here today to figure it out. We come here to filled with gratitude that God loves enough to reveal Himself to us. We come worship and adore God, who has revealed Himself to us as Father, Son and Holy Spirit, world without end. Amen. The story of David and Mephibosheth is the story of the Gospel. David’s closest friend, Jonathan, had been killed in battle along with his father King Saul. Even though Saul had sought David’s life, David mourned both of their deaths. 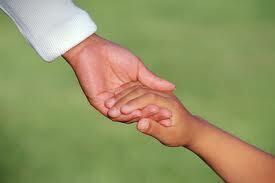 One day David asks if there is anyone left of the house of Saul that he may show them kindness. A servant tells him of Jonathan’s son Mephibosheth, who was crippled as an infant. When Mephibosheth received news that David wanted to see him, he naturally feared the worse. It would have been logical to assume that David was seeking revenge against Saul by killing his grandson. But nothing could be further from the truth. Because of his love for Jonathan, David wanted to show kindness to Jonathan’s offspring. Instead of vengeance, Mephibosheth received mercy, treated as family and was given a permanent seat at the king’s table. Like David, our heavenly Father seeks us out to show us kindness. And like Mephibosheth, we are spiritually crippled and cannot come to God on our own. Because of our rebellion against God we naturally assume that He means to do us harm when He calls for us. But grace brings us to Him and at this point we would be overjoyed if He treated us as a servant rather than as an enemy. To our amazement, His intent is to offer us mercy, adopt us as His own and give us a permanent seat at the King’s table. No wonder we call it Amazing Grace. Modern translations, such as the English Standard Version and the New Living Translation have replaced the word “believe” with the word “trust” which more accurately depicts Jesus’ call to us. When I was in high school a Baptist minister came to our house and in a private conversation he asked me if I believed that Jesus was the Son of God. The question was startling because to me that was as undeniably factual as George Washington being the first American President. But because the minister did not ask any follow up questions, the belief that I confessed only remained in the arena of historical fact. At that point in my life the fact that Jesus was the Son of God had very little impact. I was trying to live my life and figure it out on my own. If he had asked me if I was entrusting my life to Christ, I would not have been so quick to answer. Being a follower of Christ is more than just having right belief. Jesus’ call is to acknowledge Him as the Light but it is more than that. 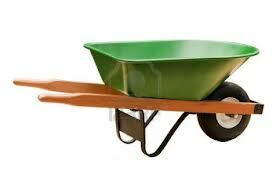 He is calling us also to walk in the Light, to trust in Him, to get in the wheelbarrow. There is a wonderful story in the Book of Genesis that answers the childhood question of where all of the languages came from. It occurs after the story of Noah and the flood, during the rebuilding of the earth. At that time everyone spoke the same language and because of that they were able to cooperate in a profound manner. Their intent was to build a tower in a city that could reach to the heavens. When God saw what they were doing He concluded that because of their unity, there was nothing that they could not do if they put their minds to it. That was a problem given how wicked the world had previously become. Evidently God decided that the only thing worse than being wicked is being organized and wicked, so he confounded their language and scattered them over the face of the earth. From that time on the place was known as Babel. The reason that story is relevant to us today is because today is the Feast of Pentecost. In today’s story we see a reversal of the curse of Babel. On this feast day God reunites mankind around the language of the Gospel. The Apostles spoke in tongues as they were given ability and when they spoke each person from around the world heard them speak in their own language. They were speaking about God’s deeds of power. This miracle of Pentecost sends them out to the ends of the scattered earth to draw all people so that we will be one flock under one Shepherd. The unifying voice of the Gospel undoes the confusion of Babel. On these points most Christians agree. Where things tend to get fuzzy is what role the Spirit plays in our individual lives. Some groups say that unless you speak in tongues you do not have the Spirit. Some even say that if you do not speak in tongues you are not a Christian. Some say that the gift of tongues has passed away with the writing of the Scriptures. Others say that the Spirit is given to make you sinless. Some, particularly in this part of the world, say that you know that you have the Spirit if you can pick up snakes and not be bitten. There is a story of an Anglican priest being invited to attend a Pentecostal service. He sat next to the preacher on the platform and saw for the first time people speaking in tongues and shaking and falling down. It made him a little uncomfortable but he thought to himself, “To each his own” and chalked it up to the diversity of gifts. But when about half way through the service they brought out the snakes the priest leaned over to the preacher and asked, “Do you have a back door in this place?” The preacher smiled a wry smile and said “No we don’t.” The priest then asked, “Do you know where you would like to have one?” It is because of such confusion that I find it helpful on Pentecost to review the reasons for the sending of the Spirit according to Jesus. I read a very good synopsis of Jesus teaching in a very approachable commentary on John by Bruce Milne and I want to expand on his points in hopes of making things more clear. First, the Spirit is sent to us to give us power to serve. After Jesus gave the Apostles the Great Commission to go into all of the world and preach and baptize, He told them to wait in Jerusalem until they had been empowered from on high. The Commission that Jesus gave to the Apostles could not be done under their own power, especially when we consider that almost all of them were being sent out to be martyrs. If they were going to do the job that Jesus gave them to do, then they were going to need the same Spirit that had come upon Jesus and that is exactly Who Jesus was going to send them. We have the same needs as the Apostles. If we want to be a safe little church that barely holds its own, then all we have to do is to set goals that we can accomplish and then get busy or at least mildly so. But if we want to be about the Father’s business, and accept the vision that Jesus would have us accept, then we embrace impossible callings and seek the Holy Spirit to empower us to do what God has called us to do. He is sent to empower us to serve. Second, Jesus sent the Holy Spirit to unite His followers into a new community. Since we have all been baptized by the one Spirit into one Body, it only makes sense that we should be one. We are not one because we all share the same politics because I’m quite certain that we don’t. We are not one because we have the same taste in food or music or even because we all have the same theology. I have no doubt that our theologies vary. What makes us one is that we have received the same Spirit and so it is like being in a very diverse family that sticks together because they are the same blood. The wonder of the Holy Spirit, however, is that He even transcends blood lines and the history of the Church has taught us that while blood is thicker than water, Spirit is thicker than blood. Third, the Spirit is sent to unite the Church to the Father. We saw this passage a couple of weeks ago when Jesus said that if we keep his words that the Father will come and make his home with us, and it is only by the enablement of the Spirit that we can keep his words. There is a song that we sing frequently during communion called, “In Remembrance.” It has a line in it that captures this idea of the Father living with us through the Person of the Holy Spirit. It says, “Don’t look above, but in your heart for God. Do this in remembrance of me.” This line was written before the rise of New Age religions that falsely teach that we all have a god within. This passage is to be understood as a celebration of a God who is immanent, who is among us, who tabernacles with us by His Spirit. Thus if you have been baptized into Christ you have received the Spirit and are one with the Father. That is a truth worth celebrating. Fourth, Milne says that the Spirit is sent to support us in loving obedience. To me the key word here is “loving.” I remember being a kid out playing baseball until it was almost too dark to see the ball. About then my parents would yell for me that it’s time to come in. My response was typically, – “Aw do I have to?” Looking back, I’m not sure why I did. It wasn’t as if my parents were going to change their minds and say, “No that’s okay Ray, why don’t you just skip your homework tonight and finish the ball game with your friends.” They never gave in and so I would reluctantly, unjoyfully acquiesced. It was anything but joyful obedience. Fifth, Jesus tells us that He will send the Spirit to bring back to remembrance all that He said. That too is very good news. I am finding that I am more consistently doing things like looking all over for my glasses only to discover them in my pocket, or walking into a room and not remember why. Have you ever experienced these kinds of forgetfulness? Well to the best of my knowledge the Holy Spirit doesn’t do a thing about them so take a shot of B-12, pour another scotch, or just get used to it. But what the Spirit does do in terms of memory is to bring to our attention all that Jesus has taught. In terms of the Church we see this promise fulfilled in the inspiration of the Bible, bringing back to the writers of the Bible all that Jesus said. In terms of the individual follower of Jesus, we see the Spirit fulfill this promise by bringing to our remembrance passages that we have read or memorized at just the moment we need them. When I was first ordained and started doing pastoral counseling, it was remarkable to me how often a person would bring up a problem that could be directly addressed by a verse of Scripture that I had read just that morning in my devotions. In fact it happened so often that at first I was suspicious of it. I became concerned that I was transferring my issues onto them, rather than offering them objective insight and truth. But when I spoke to more experienced clergy and when I saw the fruit of trusting that this was not transference or coincidence, I began to appreciate the process. It was both comforting and humbling to be used by the Holy Spirit in this way. But it was a cooperative effort. I had to be regular in reading God’s Word for the Spirit to bring back to my remembrance what I had read. I put it in East Tennessean for the Inquirers’ Class, “you can’t REmember, what you ain’t never memberd.” So be faithful to read the Scriptures and you will see the Spirit work. Lastly Milne reminds us that Jesus imparts to us the gift of the Spirit so that we can abide in the peace of Christ. St. Paul says in the Book of Romans, “…the mind controlled by the Spirit is life and peace.” (Romans 8:6). How is your peace quotient today? It is difficult to maintain these days isn’t it? Constant threat of terrorism, our nation in trillions of dollars of debt, the price of gas, skyrocketing health costs, rising tuition, the possibility of living longer than your savings, or every time you forget something thinking that it is the beginning of dementia? I am finding that I am more consistently doing things like looking all over for my glasses only to discover them in my pocket, or walking into a room and not remember why. Wait, did I mention that already? See, there it is! You get my point. There is so much every day that can rob you of your peace that it is little wonder that your average American is struggling. I read one report that said that 40% of incoming freshmen are on some form of mood altering prescription. We all could use more peace. Now I’m not suggesting that the Holy Spirit is a panacea and that if you were truly filled with the Spirit that you would never need medications. But what I do believe that Jesus is promising is a presence that remains with us through the storms of life. The thing we must remember, as is repeated in a common blessing, is that the peace of the Spirit is a peace that surpasses all comprehension. It is this way because it is relational rather than logical or situational. It is not a peace that makes sense because life is going your way or a peace that comes because the DOW is back over 13,000 and that is good because situations and circumstances are on constant flux. The Spirit’s peace is relational. He is the promise that nothing can separate us from the love of God and in the end that is the most important thing to know. We live in a time when there is so much threatening both our unity as Anglicans and the unity of the Body of Christ in general. If rather than focusing on what divides us, we focus on all that the Holy Spirit is intended to bring us; like empowerment to serve, oneness with each other and the Father, loving obedience, peace and the like, we will be a lot further down the road in accomplishing the work that He has given us to do. I end with a simple ancient prayer. Come Holy Spirit come. Amen. Because the two mentions of David playing music for Saul are so close together in the same book, but in different settings, I do not think this is a mix up in the chronological order of the story (16:23 and 19:9). Perhaps the reason that Saul did not recognize David when he came to fight against Goliath is because as 17:15 tells us, David was only a part time servant. He would go back and forth from Saul’s court to Bethlehem to help his father with the sheep. We are told in 1 Kings of King Solomon, “But Solomon did not make slaves of any of the Israelites; they were his fighting men, his government officials, his officers, his captains, and the commanders of his chariots and charioteers.” This gives us a hint of how many leaders the King oversaw without even mentioning wives, children and a plethora of servants. Given how many people were in a king’s court, it is not too much to imagine that he would not remember a part time servant. Add to this that Saul was under the stress of battle and he could be excused for a lapse in memory. Also we do not know how much time transpired between the time that David first became Saul’s servant and when he returned from helping his father to fight against Goliath. Even a few years in a young boys life can make a considerable difference in appearance as they become men. As far as the anointing of David, that was a private affair just among his brothers (1 Samuel 16:13). Saul would not have known about it at that point. David’s public anointing as King of Judah would not come until after Saul and Jonathan’s death (2 Samuel 2).